Woodworking needs sufficient space to create wonderful woodworking projects. An ultimate woodworking workshop is simple and easy to do. How authentic it looks depends on your sense of creativity. Most woodworkers prefer to utilize a garage or roomy, outdoor shed for a workshop. A woodworking workshop can be created in a basement if the basement has sufficient windows to release wood dust. Dust collectors are great investments for exterior or interior workshops. Novices generally begin with small projects while more advanced woodworking crafters need room for larger projects. Plan workshop dimensions to meet present and future woodworking jobs. Garages have ample floor space and provisions for electrical wiring for woodworking equipment and lighting. Design your woodworking workshop the way industrial engineers create floor plans. First, measure the workshop dimensions you will need and all of the equipment already used for projects. To make your workshop ergonomically correct, locate your work bench or table first since these tend to be larger in size. The size of standard work tables range from six feet to seven feet in length and are approximately 30 to 36″ in depth. These are constructed of steel or wood or a combination of both. If you need a larger work table, consider a custom size or two tables that can be connected. Consider work tables with attached shelves for extra storage. Locate large pieces of equipment where it is most likely to be used with the work bench. For example, if you regularly use a router for woodworking projects, you might want to locate this nearest the work table where sanding and polishing are done manually. TIP: Planning to Remodel Your Garage? 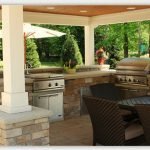 Use our free Garage Remodeling Calculator to Find Out the Remodeling Cost Instantly. 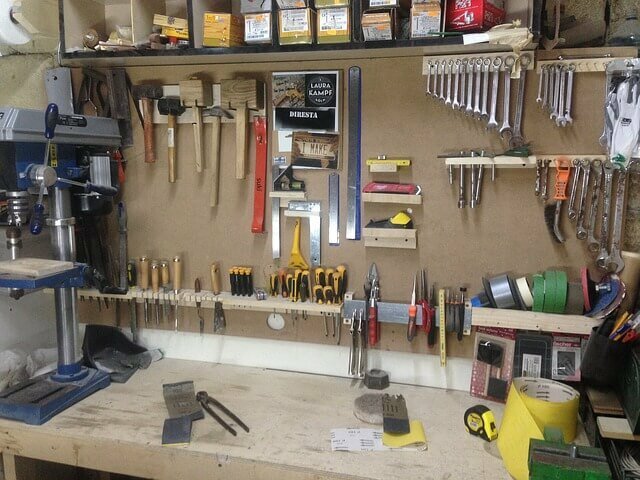 The well organized workshop includes shelving and cabinetry to store hand tools and prevent dust build up. Locate cabinets on walls or purchase free standing models as desired. These are ideal for keeping polishes, waxes, cleaners, paints, dyes and stains. Don’t forget to allow space for computer equipment used for design work and other ideas. Keep all computer equipment covered when not in use. Beginner woodworkers can create workshops without much expense. It’s simply a matter of clearing sufficient space in a garage. Then set up the design for your workspace. Most beginners already have equipment and supplies that just need more storage space. To avoid higher priced work tables, shelving and cabinets, look online for stores that sell these at reduced prices. This is also true of larger pieces of woodworking equipment found in local classifieds. Woodworkers spend a lot of time on projects. The workshop should be a comfortable place to work. Cement flooring may be hard on the feet, legs and spine. Consider covering cement flooring with floor tiles with cushioning that is easy to maintain and clean. Woodwork a special chair to match the work table for working on detailed wood pieces. Once you have your workshop organized, add a personal touch with your own woodworked sign on your door or a woodworked coat and apron rack. Add artful wood hooks to the rack to make it look stylish. Some woodworkers like decorative display cases that show their woodworking skills and talents. These display cases catch attention to browsers to the workshop. 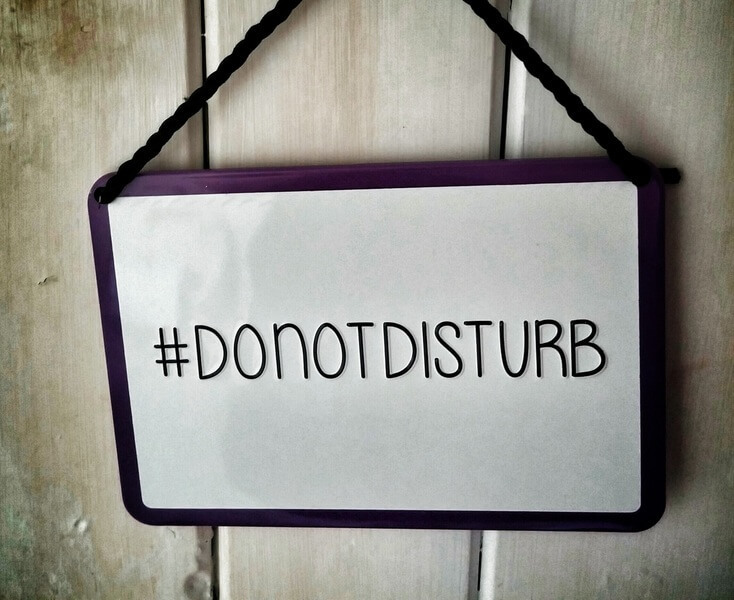 One other important woodworked sign for your workshop might include a “Do Not Disturb” hanging piece when woodworking projects require uninterrupted concentration. Woodworkers love workshops that look professional even when they are novices to this beneficial craft. Whether woodworking is a hobby or you plan to sell what you create, your workshop should be neat, organized and comfortable. Very impressed by the shelving and cabinetry that are used to store hand tools. I am definitely going to try this to help better organize my workshop. Very very informative and effective writing. I must say all the mentioned points are making some sense and Helpful for many individuals like me. Thanks for sharing this idea. Very well written article with full information. You show important tools popularly used in the woodworking. All tips in a single click. Thanks for the sharing a useful article. I like your idea. That’s are very essential for us. Woodworking garage is very needed for making every wooden furniture.